We all know the Alexa is top-class, so this video isn't a comparison. Instead, it's for newcomers or for those looking to understand the differences between a $1,295 camera and a $50,000+ camera. Maybe you might want to know if they can be matched to be used as an A-cam/B-cam. I tested for two situations, interior and exterior. Interior was tested for neutral middle grey exposure, +3 and -3 stop exposures. The shutter angle/speed was manipulated to keep colors consistent. We tested at two ISOs - 400 and 3200. This was mainly a comparison where the Pocket 4K was center-stage. The Alexa obviously is easy to make out - with shallow depth of field. We were using an Ultra Prime at T2, while the other two cameras were at f2.8. But they definitely could be matched, all three of them. I'm amazed by the image quality coming from the Blackmagic Pocket Cinema Camera 4K. It's definitely a game changer. Given the price ($1000) the BM4K is an insane value! I cant believe how good it is so far for the price. Given that it is twice as cheap as the GH5s, it is so impressive how BM pulled this off. They truly have a game changer on their hands and I suspect they will be hit hard with demand for many months! To think this is pre-release too.. I have no doubt once BRAW and additional firmware fixes/updates come along it will get better! Justin Jackson wrote: Given the price ($1000) the BM4K is an insane value! I cant believe how good it is so far for the price. Given that it is twice as cheap as the GH5s, it is so impressive how BM pulled this off. They truly have a game changer on their hands and I suspect they will be hit hard with demand for many months! To think this is pre-release too.. I have no doubt once BRAW and additional firmware fixes/updates come along it will get better! Absolutely. And BRAW is a game changer! Thank you for sharing the tests Sareesh. The comparisons are a bit hard to judge, especially the +3 stop overexposure, because the BMD and Panasonic LUTs treat the highlight and saturation rolloff very differently than ARRI's default REC709 LUT for the Alexa. It would be more objective to compare by grading from the log source images and using the charts to match to REC709, rather than adding the effect of very different LUTs on top of each one. Alternatively, you could grade in ACES or Resolve Color Management as a method to equally move the clips into REC709 before making comparisons. If you do need to compare them using standard LUTs, BMD's extended video LUT (rather than the default video LUT) rolls off the highlights more similarly to Alexa's standard REC709 LUT. Jamie LeJeune wrote: The comparisons are a bit hard to judge, especially the +3 stop overexposure, because the BMD and Panasonic LUTs treat the highlight and saturation rolloff very differently than ARRI's default REC709 LUT for the Alexa. The official 709 LUTs are designed to conform log footage to standard Rec. 709 colors and specs. There is no other test that will equalize all cameras in any fair way. Also, most people will ever only see videos in the Rec. 709 format (YT, Vimeo, etc.). Whether their monitors are even calibrated for it is another matter. I totally get what you're saying, but the scope of the this video is restricted to newcomers. The choices made are based on the audience viewing them. It's for newcomers who don't understand why DPs use an Alexa when their [name of their favorite camera model] can shoot 'cinematic' images. That's all the test was designed to accomplish. Like I said in the video, it's not a comparison. Even so, the Alexa would destroy both. The official LUTs have been designed to be scientific, or so we are led to believe. We have to put a certain amount of faith in it. If not that, then the only alternative is to gather a bunch of electrical engineers and do a DXOMark-type test. Even then, there are people who always complain about the methodology. That's why we have different cameras and colors in the first place! Look how Panavision partnered with Light Iron instead of going IPP2. All this is not against what you're saying, of course. I'm not disagreeing with you, just speaking generally. I wish the new BMD Extended v4 LUT was used. Ignore me, should've read these replies first. Sareesh Sudhakaran wrote: The official 709 LUTs are designed to conform log footage to standard Rec. 709 colors and specs. There is no other test that will equalize all cameras in any fair way. Also, most people will ever only see videos in the Rec. 709 format (YT, Vimeo, etc.). Whether their monitors are even calibrated for it is another matter. But unless I'm completely misunderstanding you, comparing the LUT-normalized footage of the 3 cameras is as much a comparison of the LUTS as it is cameras. Without grading the images, how do you know what was actually captured? Would you be willing to provide sample frames? Good video Sareesh. You might point out that the Alexa is super durable and has a large ecosystem supporting professional production and attachments. However. That bulb does look better handled in the pocket than Gh5 (it's like a stop difference so it's not much). Straight off the bat, the Alexa skin tones are a lot better. The low light and over exposed samples are clearly better in the Alexa. The Alexa does clearly make .... look better. How much you can work them together is an issue. So, the funny blue of the pocket I'm not too worried about if it can all be graded to match the alexa. The Alexa skin toning is better, and the Gh5 worse (dynamic range effect). Now, if I gave somebody the worse consumer camera I have and told them to go out and name a movie, the Alexa would clearly be better. However, if I could use the oldest still camera I have as a movie camera I need controlled light, it might put up a reasonable performance, as it probably uses a older version of some of the Alexa technology (as the company.that did Alexa had previously bought that company I think from memory). Love that little thing, hdr just changed my perspective way way back. The Alexa technology can probably do a lot more stops but I suspect the number of stops is limited to a high quality range near to the human eye. With my older stills, it can do more, but the quality drops off. Sareesh Sudhakaran wrote: the Alexa would destroy both. Debayering is the same thing, so is Log encoding. An official Rec. 709 LUT is the only way to compare different cameras. You can try recovering highlights (as shown in one of the examples) or shadows, and white balancing to make sure no human errors are made. But short of this, every other kind of test adds a human variable and subjectivity to the mix. All cameras have their specialized RAW processing software. We need to use them, and that becomes an entirely different exercise. Not the scope of this video. Wayne Steven wrote: Good video Sareesh. You might point out that the Alexa is super durable and has a large ecosystem supporting professional production and attachments. Of course, but Alexas fail as well. Overall it has definitely proved value for money for rental houses. Especially the Mini. The newer models are a harder sell, which probably explains the LF. So, the funny blue of the pocket I'm not too worried about if it can all be graded to match the alexa. The Alexa skin toning is better, and the Gh5 worse (dynamic range effect). I wasn't really expecting the BMPCC 4K to do so well, to be honest. Early marketed footage looked video-y and not encouraging. but I liked the Bubble Gum video. And my findings are that this camera is stellar - definitely better than the GH5 as far as image quality is concerned. Sareesh Sudhakaran wrote: Debayering is the same thing, so is Log encoding. An official Rec. 709 LUT is the only way to compare different cameras. Normalizing an image to rec. 709 with a LUT is not a representation of all the data the camera actually captured. Even on your own terms, the footage from all 3 cameras would have to be subject to identical log to rec. 709 transformations for the comparison to be meaningful. But that's not possible, either. The only way to know is to grade the images. Not doing so doesn't make the test scientific or objective. It's full of inconsistent operations from the very beginning, staring with the LUTs. Last edited by John Paines on Fri Sep 28, 2018 4:03 pm, edited 2 times in total. Thanks Sareesh for your tests and comments. That's not true. It requires assuming that all of the cameras have both identical Bayer patterns, dyes, photosite designs, analog to digital converters, and calibration, which is obviously not the case, since the sensors are so hugely different. So if you're taking raw footage and applying a generic Rec 709 LUT to compare the results, you're using the LUT incorrectly. If you're using the same Arri provided Rec 709 LUT to compare results, you're still using the LUT incorrectly. To compare them sensibly you need to use the vendor provided IDTs to convert their raw images into a standard color space such as ACEScct, and THEN apply a Rec 709 LUT to compare the outcome. Then you can see differences in how they render color, which allows you to plan ahead if you're planning to match them. If you're just trying to determine whether or not indie filmmakers who can't afford Alexas should be jealous, then the comparison is pointless (and a waste of time, since the ones who are smart will just go out and happily use their Pocket 4K cameras, and the ones that are jealous will continue to complain instead ). I think Sareesh was just using the Alexa as a known industry standard, and was actually showing how good the new Pocket was compared to the GH5, in coming close to, but not necessarily as good as the Alexa. His demo was more about showing how good results are easily attained with the new Pocket. Sareesh Sudhakaran wrote: There is no other test that will equalize all cameras in any fair way. Yet on the issue of using those LUTs as an objective comparison, I respectfully disagree with you sir and I would like to explain why. Despite all having REC709 in the name, the LUTs used in the video were designed with very different philosophies. The goal ARRI had for their default REC709 LUT was to produce the best possible looking image within REC709, while the BMD and Panasonic default REC709 LUTs were designed to match the limited dynamic range and sharp knee of classic REC709 broadcast cameras. Although the LUTs are all working to keep the image within the defined REC709 spec of about 6 stops of latitude, subjective decisions were made by each company about how to handle the dynamic range captured by each camera that is well beyond six stops of REC709. BMD's new Extended Video LUT, for example, also is designed to normalize a log image for REC709, but with that LUT BMD made different decisions about how to roll off the highlights and saturation, much more in line with how ARRI designed their default REC709 LUT. A lot of subjective decisions are made with any LUT, even when the LUT is designed to transform log source images to fit within a defined display spec. RCM works in basically the same way, but starts with a different default look than ACES. I think the question as to whether to grade or not to grade, and using advanced luts is moot. Just as Denny stated, the video is more about showing off what these other two cameras can do against the industry standard. It's not about what the Alexa can spew out. After all a grade is an objective process. The Alexa is used for motion pictures, so the question should be "can we use the BMPCC 4K or the GH5 in that regard, from what we have seen from this video. I can't express enough gratitude to Sareesh for getting the BMD camera close enough to the Alexa in this test. (I don't want to call it a comparison test). I remember when the BMCC 2K first came out, some guys in London announced to undertake such a test. We were all rubbing our hands in anticipation until we learnt the test had been called off. Super 16 was once king; 2K has come and almost gone, and now the genie is out of the bottle, We would see if the BMPCC 4K, can hold out on it's own, on the silver screen. I don't think you've understood what I'm talking about. If you expose different cameras to a chart with a middle grey, white balance correctly, shoot in log - then simply add the official 709 LUT, each camera should reproduce the color chart identically. And good cameras like the Alexa and the Varicam can produce really accurate results, as if you're seeing the chart in person. This is the only standard test I know of that can be done by us, short of a lab. Isn't that what Davinci RGB color space does within Resolve? The official LUTs have been provided, and I trust BMD has been loyal and correct in their implementation of it. Unless you have reason to believe everyone should start grading in ACES and bypass the native space in Resolve. You should read the comments on YouTube before you assume how useful or useless it is to other people. The takeaway for me is how excellent the BMPCC4K is when compared to other cameras in its class or higher, as far as image quality is concerned. Can't wait for the next evolution of this camera with an APS-C sensor. Hey, I'm not trying to appear condescending, so apologies if it appears so. Denny Smith wrote: I think Sareesh was just using the Alexa as a known industry standard, and was actually showing how good the new Pocket was compared to the GH5, in coming close to, but not necessarily as good as the Alexa. His demo was more about showing how good results are easily attained with the new Pocket. Jamie LeJeune wrote: Yet on the issue of using those LUTs as an objective comparison, I respectfully disagree with you sir and I would like to explain why. I don't disagree with you, Jamie. But as mentioned, it's beyond the scope of the test. Aaron Green wrote: 100% agree. BMDs Rec709 LUT was unusable. I have no clue what you're talking about. Even with this the footage looks amazing if you shoot in RAW. The Extended LUT is definitely better, and is what I would prefer to shoot as well. Sareesh Sudhakaran wrote: I don't think you've understood what I'm talking about. If you expose different cameras to a chart with a middle grey, white balance correctly, shoot in log - then simply add the official 709 LUT, each camera should reproduce the color chart identically. Which "official" rec 709 LUT are you talking about? I think that's where the misunderstanding is coming from. Arri's rec709 LUT isn't guaranteed to work particularly well with BMD's log footage or with Panasonic's, for example. The DaVinci color space is analogous to ACES, so yes it's reasonable. There was a smiley in there for a reason. That said, if you poke around on these forums enough, you'll see that I'm spot on. There will always be a cadre of people who only ever shoot tests and look for excuses for why their cameras aren't good enough to make great films, and then just complain a lot. And then there are people who will ignore the silliness and take advantage of the fact that Black Magic cameras can deliver great image quality by any standard. Sareesh Sudhakaran wrote: If you expose different cameras to a chart with a middle grey, white balance correctly, shoot in log - then simply add the official 709 LUT, each camera should reproduce the color chart identically. True, but only if you expose exactly for middle grey as defined for each camera's respective log curve. The moment you're doing overexposure or underexposure comparisons using those LUTs, the same logic no longer applies (unless you are normalizing the exposures to proper middle grey in linear space using nodes before the LUT, but based on the video it doesn't appear that's how you were processing the signal). Both the LUTs and the charts were designed only for correct exposure of middle grey. The moment you use them otherwise, you're no longer comparing anything about the sensors, but are instead comparing how the different LUTs handle exposures outside of what they were designed for. You can draw reasonable conclusions about the LUTs in over/underexposure, but none about camera sensors in over/underexposure. Rakesh Malik wrote: The DaVinci color space is analogous to ACES, so yes it's reasonable. Davinci Resolve Color Management is analogous to ACES. But, Sareesh was working in Davinci YRGB space which is not at all analogous because it is not color managed to scene referred data. Rakesh Malik wrote: Which "official" rec 709 LUT are you talking about? I think that's where the misunderstanding is coming from. Arri's rec709 LUT isn't guaranteed to work particularly well with BMD's log footage or with Panasonic's, for example. Nobody used the Arri LUT on the BMD or Panasonic footage. Just to clarify. There are official Log to 709 LUTs for all three cameras. GH5 also has a direct link to V-Log L to 709, which is the exact same as V-Log to 709. Jamie LeJeune wrote: True, but only if you expose exactly for middle grey as defined for each camera's respective log curve. Why not? The response is different, but that's what we're testing. Converting to linear space happens in Resolve RGB (or ACES, etc.). then it goes back again for the final viewing standard. Both the LUTs and the charts were designed only for correct exposure of middle grey. The moment you use them otherwise, you're no longer comparing anything about the sensors, but are instead comparing how the different LUTs handle exposures outside of what they were designed for. Nobody was comparing sensors. You're still thinking of this test in terms of a comparison, which it is not. You mean Resolve cannot read metadata from Arriraw or CDNG? As far as I know it does it perfectly. If any, footage from the GH5 might not be treated perfecting but I have enough experience with it to confidently say what is in the video is definitely what you'll get. Again, you are wasting your argument on this test. It's not a camera shootout. Sareesh, first off I'd like to thank you for putting together the video. If nothing else, it helped elevated the BMP4K stature to that of the big boys (namely Arri here). Having said that, in this forum of professionals who know what they are talking about (that includes you), this kind of test only generate jealousy and unwarranted and wrong conclusions. Your test does not do anything more than compare the difference in these 3 cameras. I have to say that reading through the post, I can only say I agree with the responses that Jamie and Rakesh offered. If the intention was for (your term) newbies who are just looking for a feel good for justifying ownership of the BM Pocket 4K, well I think it has achieve its goal. Personally, I would not have done such a thing. With all respect to everyone here, I rather suggest that a good and informative video should be made on how a "newbie" or "pro" (doesn't really matter) can capture footage on a BM Pocket 4K and deliver or match the footage to as close as that of the Alexa. Show the workflow of how you can take a BMP4K Raw (and Prores) footage and get it to the Arri levels, then grade it to REC.709 so they come equally close to compare. That my friend is a valuable read or instructional video. That's my 2 cents and I hope this will help you think about your next video. The current video just became pointless for what it is intended to do. I'm just being candid and do not mean to offend because I still enjoyed watching it. Sareesh Sudhakaran wrote: Converting to linear space happens in Resolve RGB (or ACES, etc.). then it goes back again for the final viewing standard. 2) LUTs can only map between black and white and can’t access the under-black (below zero) and over-white (above 1.0) data that Resolve can with it's floating point operations. So, in the order of operations if any data is clipped by a LUT, as is the result when BMDs default REC709 LUT is applied to an overexposed clip, any image data pushed over 1.0 by the LUT is gone after that point in the chain. Thus, attempting recovery of the highlights through exposure correction always has to be done before the LUT rather than after. Because Resolve Color Management and ACES don't rely on LUTs to normalize the signal for REC709, all data from the original signal can be recovered at any point in the node tree. Sareesh Sudhakaran wrote: You're still thinking of this test in terms of a comparison, which it is not. Sareesh Sudhakaran wrote: You mean Resolve cannot read metadata from Arriraw or CDNG? That's definitely not what I mean. Resolve can certainly add automatic transforms on top of the debayer to those sources. But if you're working in Davinci YRGB, the transforms applied are not scene referred, so they add additional variables to the camera comparison that wouldn't be there in RCM or ACES. Rather than get held up on the terms, I'd suggest taking the +3 stop overexposed clips and comparing them in ACES (setting the correct IDT for each camera and the ODT to REC709) and I'd bet you'll be able to recover more information from the highlights of the 4K Pocket images than was shown in your video. In other words, I think we're on the same page here about the Pocket. I think the 4K Pocket is an even better camera than it appears in the video because I'm pretty sure the method used to grade the files inadvertently cut off some of the actual dynamic range offered by the 4K Pocket. Last edited by Jamie LeJeune on Sat Sep 29, 2018 8:37 am, edited 2 times in total. I agree, I was very horrified at the original 709 mode results in resolve. Two things matterz mapped ungraded comparisons, and how much effort to get it as close or better to the better camera. Official or not, LUTs are massive compromise. Your test as much as it gives some useful info is also far from 'perfect'. For what you tried to show you should grade difficult scene and then try to find/point out limitation for each camera. Using official LUTs on top of heavily over/under exposed footage is about pointless, even if it will most likely show camera with better color science. Jamie LeJeune wrote: I'd suggest taking the +3 stop overexposed clips and comparing them in ACES (setting the correct IDT for each camera and the ODT to REC709) and I'd bet you'll be able to recover more information from the highlights of the 4K Pocket images than was shown in your video. I've only been using Resolve to grade since May, so I haven't even looked at ACES. Now you've given me some motivation to try this workflow! Good on you Sareesh. In the end, in work, people are supposed to move away from luts, so it is good to see what can be done in future. Jamie LeJeune wrote: How Resolve does it's internal math is not the issue. Resolve has three color management modes -- Davinci YRGB, Davinci Color Managed, and ACES. Only the latter two of those are scene referred and automatically color managed. There's a bit of a misconception here, because DaVinci Color Managed uses the DaVinci YRGB color space. The difference is that if you don't use the color managed option, you have to set everything up yourself, but you can still set up a scene referred workflow. It's just a lot easier to let Resolve do that for you. Sure, using Color Space Transform OFX nodes, you could kinda build a scene referred color managed workflow in standard Davinci YRGB mode, but there are some caveats. The CST OFX does all its math assuming 6000K white point, which isn’t ideal if you shot under tungsten. Better to use Davinci Color Managed which will read the kelvin from raw clips for better tungsten results, and plus you don’t have to fuss with all the CST nodes. Yep, Log to Rec709 LUTs are just a factory look provided by each camera manufacturer. They are different and usually clips a lot of highlights data. It is better to use Color Space Transform node with Gamma/Saturation mapping ON. It is more mathematically fair and uniform method. Sareesh Sudhakaran wrote: I've only been using Resolve to grade since May, so I haven't even looked at ACES. It's a good workflow to experiment with if you find yourself often using multiple cameras in the same timeline. It's also good preparation for the future we are all headed for where scene referred referred color management is necessary to efficiently produce a range of HDR and SDR deliverables. I took a look in Resolve today and it seems that BMD hasn't yet added an ACES IDT for the 4K Pocket camera. They do have one for Davinci Color Managed so if you're using the 4K Pocket that will be the color managed mode to use until BMD adds an ACES IDT for the 4K Pocket. Jamie LeJeune wrote: It's a good workflow to experiment with if you find yourself often using multiple cameras in the same timeline. It's also good preparation for the future we are all headed for where scene referred referred color management is necessary to efficiently produce a range of HDR and SDR deliverables. ACES is a lot more relevant if your workflow includes other tools besides Resolve, like Cinema4D, Nuke, Clarisse IFX, and that sort of thing where you need to share assets between Resolve and those tools. The DaVinci color managed workflow is if you stay within Resolve, basically the same. Of course, it IS quite possible to use ACES color spaces to exchange data between Resolve and Clarisse IFX (for example), while working internally within DaVinci color managed mode, as long as you get the color space transforms right. ARRI'S Rec709 LUT deviates from the spec at the top end quite significantly with a fair amount of highlight roll off that Rec709 does not have. Our Rec709/Video LUT deviates only mildly and will still clip highlights fairly harshly as the 709 curve technically should. Our new Extended Video LUT would be more similar to ARRI's Rec709 LUT in that regard as it has a very gradual highlight roll off. Thanks, sounds good. Actually, HLG? CaptainHook wrote: ARRI'S Rec709 LUT deviates from the spec at the top end quite significantly with a fair amount of highlight roll off that Rec709 does not have. Our Rec709/Video LUT deviates only mildly and will still clip highlights fairly harshly as the 709 curve technically should. Our new Extended Video LUT would be more similar to ARRI's Rec709 LUT in that regard as it has a very gradual highlight roll off. As far as I know "highlight roll-off" isn't part of the Rec. 709 spec at all. Anyway, it isn't in the scope of the test. All digital sensors capture image in linear gamma. They just hard clip light in one single point and don't have highlight rolloff at all. Highlight rolloff is just a post processing "look". it is all about how you transform all sensor dynamic range captured with linear gamma to physically based LOG gamma or to monitor Rec709 (S-shaped) gamma curve. Most video cameras just don't allow to control that low level processing and only output in-camera processed Rec709 video with baked "look" and baked Highlight rolloff. That's why people think that digital sensors have Highlight rolloff. The only real hardware value of digital sensors is dynamic range they can capture. More dynamic range - more natural and film-looking highlight rolloff you can get in post. I doubt it. Materials can also have nonlinear factors. Sensors also have response curves, it's an issue in colour science that gives miscolourisation. Here this article talks about the non linearity of image sensors, which have to work to produce usefull linear outputs. 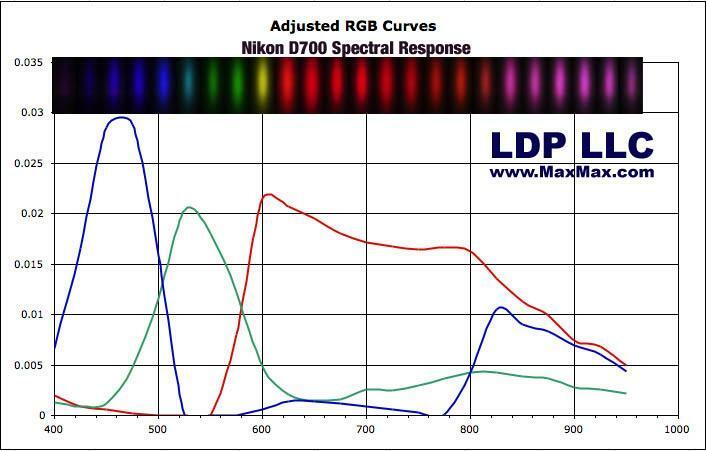 Here is example of the spectral response curves, and in a real camera given color filters. Why, because increasing light levels produce colour constancy errors. Even though all wavelengths might increase by the same amount of energy, the frequencies with higher response on the sensor will brighten the image more and shift the colour. Sareesh Sudhakaran wrote: As far as I know "highlight roll-off" isn't part of the Rec. 709 spec at all. Anyway, it isn't in the scope of the test. Well, then according to your own definition of the REC709 spec, you used a LUT for the ARRI images that isn't anywhere close to that spec. And that means the one thing that was to supposed be the controlled variable in the comparison is, in fact, not a control at all. When you're doing an A/B comparison of cameras to which vastly different LUTs have been applied, and one of those LUTs has a very gentle highlight rolloff while the other 2 LUTs sharply clip the highlights, and then on top of that you compare the images when overexposed by 3 stops, the difference between the LUTs is 100% within the scope of your test. As a test, it was not at all an objective comparison of the actual signal produced by each camera. It was really more a comparison of just the three different LUTs. And that's completely fine, as long as you're honest with your viewers about what they are actually seeing on screen. I agree Jamie, after the explaination of the different LUTs the comparison is more apples to oranges and about the LUT more than the cameras. It’s helpful, but not as apples to apples as originally thought. I'd like to know what happend to the skintones in the test with the sitting woman. They are looking extremly softend out in the video - even in 4k. Like too much denoising with the wrong settings. Jamie LeJeune wrote: As a test, it was not at all an objective comparison of the actual signal produced by each camera. That's what I've been telling you from the start, yet you persist in continuing to interpret it as a sort of comparison. Please watch the video again. There's nothing more to explain, really. Last edited by Sareesh Sudhakaran on Tue Oct 02, 2018 9:09 am, edited 1 time in total. Robert Niessner wrote: I'd like to know what happend to the skintones in the test with the sitting woman. They are looking extremly softend out in the video - even in 4k. Like too much denoising with the wrong settings. No noise was added or removed. No sharpening was added or removed. Either in camera or in post. OK, but then it seems Youtube compression killed all the skin details. Would you mind to upload a few screenshots directly from the source? it's for newcomers or for those looking to understand the differences between a $1,295 camera and a $50,000+ camera. Maybe you might want to know if they can be matched to be used as an A-cam/B-cam. Thanks to its design flaws, your test doesn't reveal the differences between the cameras or whether they can be matched. And with no explanation of how the LUTs have affected the test results, and no acknowledgement that recoverable data may exist beyond the range you present in any or all of the clips, it's unclear what "newcomers" are supposed to make of it. You note above that you lack grading experience. Perhaps that accounts for the strange design of the test. Last edited by John Paines on Tue Oct 02, 2018 4:56 pm, edited 1 time in total. I'm not talking about your footage my man. Just a general statement. The old BMD to Rec709 LUT wasn't acceptable as a final look IMO. If you disagree then I respect that.